Sons of Steve Garvey: Dodger Stadium Renovation: LAT Calls It "Work In Progress"
Dodger Stadium Renovation: LAT Calls It "Work In Progress"
Enter [Janet Marie Smith, the Dodgers' senior director of planning and development], hired by Dodgers President Stan Kasten after stints working for the Atlanta Braves, Boston Red Sox and Baltimore Orioles. Smith in turn brought in Los Angeles architect Brenda Levin, landscape architect Mia Lehrer and Thomas Quirk of the Massachusetts firm D'Agostino Izzo Quirk Architects. Changes made by Frank McCourt, the previous owner, were mostly limited to the lower bowl. Much of the new work has centered on outside the stadium, in particular redesigning the sequence that takes fans from their cars to their seats. There is still no single main entry, but the architects have pushed the walkways around the exterior of the stadium outward into the parking lot, at several points, by an average of 35 feet. Into those new spaces they've inserted amoeba-shaped planters, children's play areas and stores selling Dodger souvenirs. Inside, the architects have removed the last few rows of seats from sections on four levels, replacing them with drink rails where fans can pause and watch the game standing up. Removing seats has also widened the concourses at the rear of each section. During Friday night's exhibition game with the Angels, the lines for hot dogs and beer were still long and slow-moving. But removing seats has made it easier to see the field from many of the concourses and made some of them less dark and cave-like. Quirk and his firm, who were in charge of the changes beneath the stadium to the locker rooms and other facilities, also redesigned two sections of seats at field level to improve their sightlines. 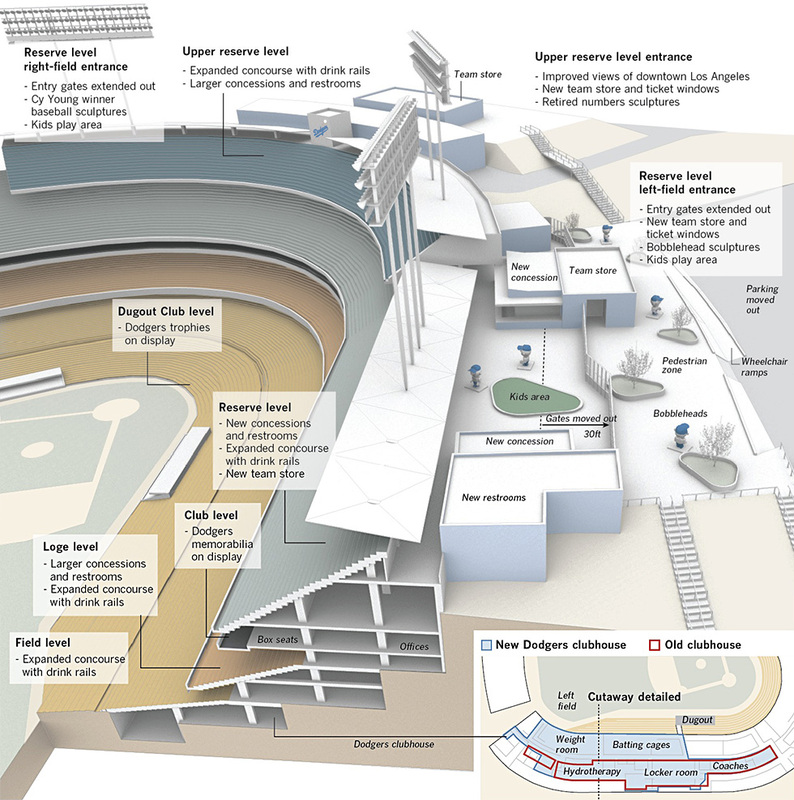 By reconfiguring some parking lots the Dodgers say they've kept the number of spaces the same. The seating capacity is down slightly, but the team says it could make up some of the difference by selling standing-room seats. There is also a noticeable effort in new signs and graphics around the stadium to pay better attention to Dodgers history, both from the team's early years in Los Angeles and its decades in Brooklyn. This is another departure from the original design, which was almost ruthlessly forward-looking. And it makes sense given how much history the Dodgers have accumulated in Los Angeles. 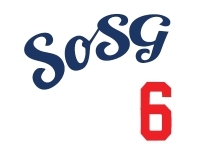 The team has now spent nearly a decade longer in Chavez Ravine than it did in Ebbets Field. To be sure, the effort to make the stadium more public — to slow the transition between car and seat — also gives the team more chances to coax fans to spend money. But the larger architectural story playing out here is no less dramatic because it is driven in part by the team's concern for the bottom line. Making one of the most privatized stadiums in professional sports more public-minded while also preserving its original architectural character is a major effort. If the goal is huge, the new owners' moves in that direction are tentative. A shuttle from Union Station — a cooperative effort between Metro and the Dodgers — will this year use a dedicated lane on Sunset Boulevard for the first time. But it remains unclear what the team, over the long term, will decide to do with the excess space along the periphery of the parking lots. The stadium site is 260 acres in all, and only some of that room is needed for cars. 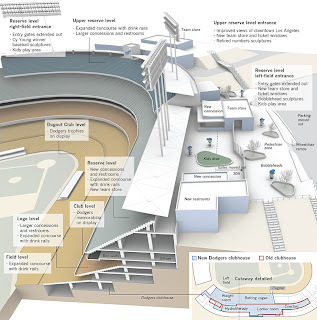 That's where the potential really lies in rethinking Dodger Stadium's relationship to the city. It's curious to me that Hawthorne focuses on the interior upgrades--some of which seemed to be positive, some of which seemed to be a little hollow (I'll get into this later when I post more pictures from opening day). And then he ends his piece with a call for addressing the peripheral pieces of the stadium property, which was clearly not part of the Stadium's renovation focus. Maybe Hawthorne had to park in that lot way up above the Think Blue sign (or even worse, he couldn't find a bathroom up there to use!). I just want to say one word to you. Just one word. Hexagons. There's a great future in hexagons. Think about it. I have a lot of comments on the renovated Yard, too, that I'll post later. Some good, some bad. But I'll be fair. I'll only be able to review the Reserve level changes tonight, but I hope to get a field level ticket soon and explore the whole thing. I am happy that the new ownership is spending a gazillion dollars to improve beautiful Dodger Stadium. I just don't want them to do too much. Dodger Stadium is a cathedral to me and I want it to stay that way. @Dusty...I'm looking forward to your comments on the changes. And yes, I have no doubt you'll be fair! I can definitely report that it's still a cathedral, as it always should be. It's more like if a cathedral added some more crosses and candles and hymnals, but there was still a long line to take communion.